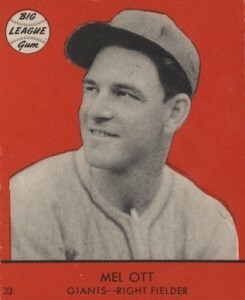 While he might have been overshadowed by his American League counterparts, Mel Ott wrote the record books when it came to power hitting in the National League. In this list of the Mel Ott baseball cards, you'll find some of the most famous cards from the 1930s as well as some of his more budget-friendly options. Shop for Professionally Graded Mel Ott Cards on eBay. 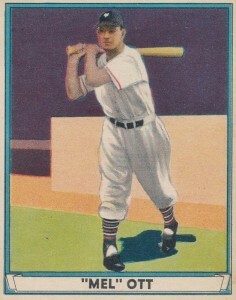 Although American League sluggers like Babe Ruth and Jimmie Foxx grabbed much of the attention, Ott was the youngest player to reach 100 home runs. He would eventually become the National League home run leader until another Giants great, Willie Mays, surpassed him. Ott was also the youngest player to hit for the cycle until Mike Trout bested that record more than 70 years later. So feared at the plate was Ott that he would end up setting many records for drawing intentional walks. He was walked five times in a game three separate times and set a record for being walked in seven consecutive appearances. It is reminiscent of the treatment another Giants slugger, Barry Bonds, would get at his peak. Ott, along with long time teammate Carl Hubbell, were captains of the New York Giants for nearly two decades, leading the team to three pennants and a World Series title. 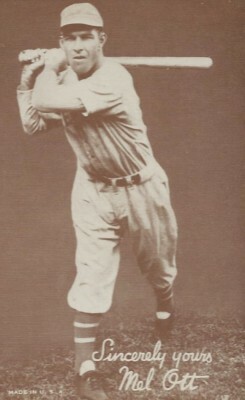 Ott was so dominate in the Giants lineup that he led the team in home runs for 18 consecutive seasons, which was another all-time record. 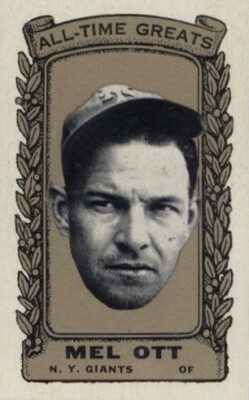 As many of key Mel Ott trading cards are found in the 1930s and 40s, they are often out of reach for collectors on a budget. Look instead to some of Ott's cards from the 1960s, incuding his appearances in the 1960 and 1961 Fleer sets, 1961 Golden Press, and 1961 Nu-Cards Baseball Scoops set. Ott has also been regularly featured in recent Panini sets and you can find a whole host of his appearances in 2015 Panini Diamond Kings, 2015 Panini Cooperstown, and 2014 Panini Classics. While the main component in building this list was card value, each card's unique design and desirability for the collector was also taken into account. In each box of Bazooka bubble gum you could find five of these All-Time Greats cards randomly inserted. In total, there were 41 cards to collect, with the main set having a gold background. There was also a limited edition silver background that has proven to have more than double the value of the gold design. Although the facsimile signature is not really Ott's signature, the style is somewhat similar to his autograph except it is missing a loop at the beginning of the "M" in Mel. The Exhibits photocard sets frequently offer an appealing budget-friendly starting point in building a collection for Hall of Fame players. Goudey's last set features black-and-white photos on solid color backgrounds of yellow, blue, green, or red. Cards are sometimes miscut so that the player's position and card number will appear at the top of the card rather than the bottom. For those interested in building a collection centered around the 500 home run club, Ott is one of the less heralded members of the elite group and actually became the first National League player to reach the mark. 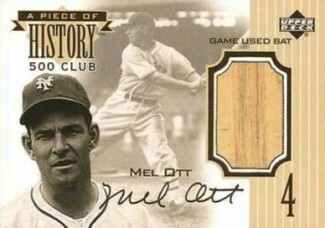 Mel Ott was tragically killed in a car accident in 1958, making his bat and jersey relics far more common than his signed cards which are exclusively cut autographs. An early relic example is this 1999 Upper Deck A Piece of History and, more recently, you can find Ott relics in 2015 Panini National Treasures. While Play Ball's earlier sets have their own key cards and popularity, it was when they included color in their baseball card sets that the cards would reach an even higher level of popularity. The reverse side reminds us Ott was small of stature but was able to generate his huge power swing by lifting his right leg to incredible heights when swinging. 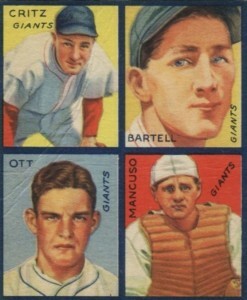 Ott can be found scowling in the lower corner of his 1935 Goudey 4-In-1 card along with three of his New York Giants teammates. Although none of the teammates featured with him reached Ott's level of stardom, they each contributed to either the Giant's World Series title in 1933 or their pennants in 1936 and 1937. 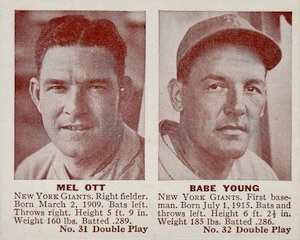 Although most of the cards in the 1941 Double Play set are positioned horizontally with two close-up photographs of the players, Ott has one of the rare vertically-framed cards in addition to a horizontal card with Babe Young. 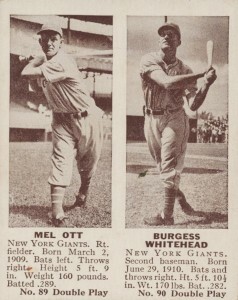 Ott shares his second card with Burgess Whitehead who was an All-Star second baseman for the Giants during their back-to-back pennant wins in 1936 and 1937. The Mel Ott card in 1934-1936 Diamond Stars includes a painted photograph demonstrating his unorthodox bat grip which saw him choke way up on a heavier bat than would typically be used for a person of his stature. 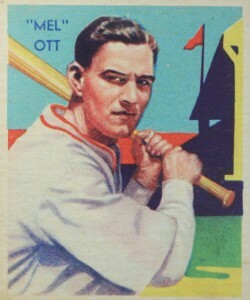 Ott's card looks to have been issued in 1935 as his cards only features statistics for the 1934 season. 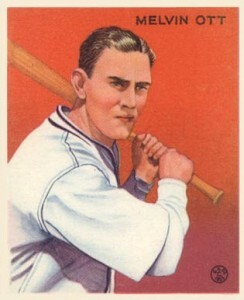 As one of baseball's biggest stars, Ott was featured on several of the Wheaties series of cards over many years. 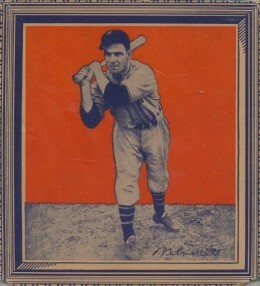 This card was inlcuded on the back of the cereal boxes during 1935 and, to go along with the Wheaties color scheme, the player photos are tinted blue with an orange background. Collectors have dubbed this the "fancy frame" set because of the simulated frame in the design. 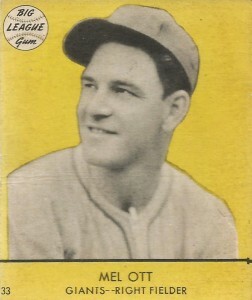 Like several of the superstars included in 1933 Goudey, there are multiple Mel Ott cards in the set. Both card #127 and #207 are considered to be rookie cards as it was one the earliest cards of him available nationwide. 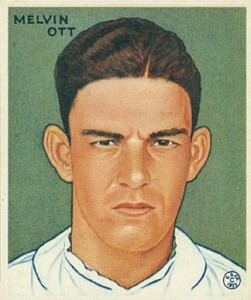 This portrait gives the impression that Ott had a mean disposition but the famous quote "nice guys finish last" was said by Leo Durocher about Ott's easy-going attitude and his struggles as the New York Giants manager. 1934 - 36 BATTER - UP # 27 MEL OTT N.Y. GIANTS !! VINTAGE 1961 FLEER BASEBALL GREATS CARD #68 MEL OTT HOF "UN-CREASED MID RANGER"
If I send you a picture of a Mel Ott card, can you provide a value? Email trey@cardboardconnection and I will take a look. 1939 Play Ball #51 Mel Ott Giants HOF PSA 3 ! !